How to add a menu bar or tabs at the top of the Blogger (Blogspot) site? Like on this site, there's a "home" tab at the top. By default, the blogger templates do not provide menu bar or tabs at the top, but there's a easy way to do it- by using the static page titles as tab names. 1. 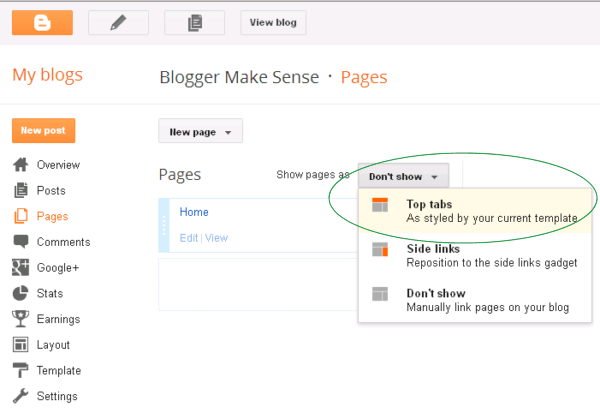 Click on "Pages" option at your Blog dashboard, at left side under the option "Posts" (screenshot below). 4. Now go back to look at your webpage, you should at least see one tab shows up at the top of the site: home. From now on, whenever you create a "page" (note: not a "post"), the "page" title will come up to the top as a menu tab. What's your experience of creating the menu tabs, do you have another way to add tabs, there's any other good menu tab solutions? Share your experience and insights in the comments box below.